Spaceworks Tacoma is guided by an amazing group of people from the community who give their time and expertise to help provide direction for the program. Read on if you’d like to learn more about each of our Steering Committee members. May 2014, Spaceworks accepts award for “Downtown Revitalization”!!! 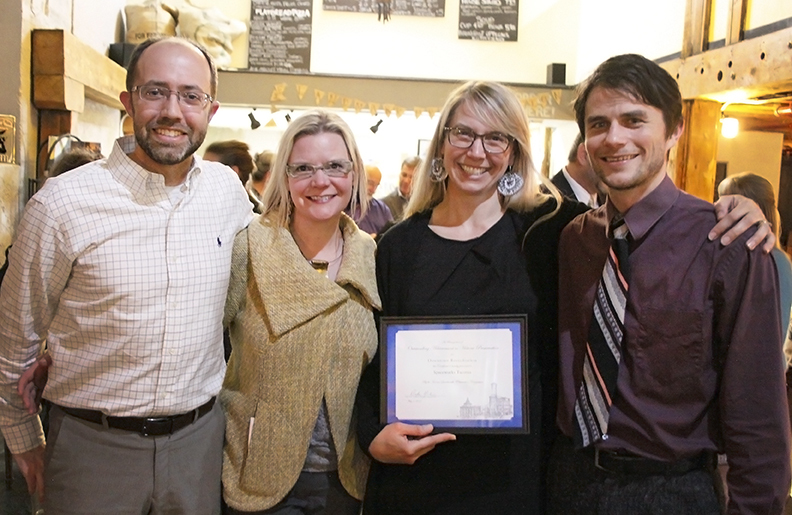 From left: David Schroedel, Metropolitan Development Director, Tacoma-Pierce County Chamber; Amy McBride, Arts Administrator, City of Tacoma; Heather Joy, Spaceworks Manager; Gabriel Brown, Spaceworks Artscapes & Marketing Coordinator. Amy has over 16 years experience as an art professional. Working with the Tacoma Arts Commission, Ms. McBride manages three funding programs for arts organizations and artists; implements public art projects, develops innovative and collaborative programming and formulates effective policy. Ms. McBride came to Tacoma in 1999 after coordinating the arts program for Bellevue College’s extension program. Amy has presented nationally on issues of public art, temporary art installations, and civic democracy through Americans for the Arts. She holds a BA from the University of Colorado-Boulder in French and Art History with a year of focused study at L’Universite de Bordeaux. Post graduate work includes a stint in the sculpture department at the Academy of Art University in San Francisco and a certificate in Fundraising Management from the University of Washington. Amy earned a Masters degree with a focus on Urban Arts from the University of Washington-Tacoma in 2010. She founded Spaceworks Tacoma in 2009 in partnership with the Tacoma-Pierce County Chamber. David Schroedel is the Metropolitan Development Director for the Tacoma-Pierce County Chamber of Commerce. In this role he provides oversight for a number of Chamber programs such as downtown Tacoma’s Business Improvement Area, Tacoma’s transportation management association Downtown On the Go, and Spaceworks Tacoma. David’s experience in community planning and development provides him with an array of community resources to help these programs and Tacoma thrive and grow. Before joining the Chamber, David operated his own consulting firm, Schroedel Planning Services, where he worked with a variety of public and private clients on development and land use issues. David has also worked as a community planner and community forester in private, public and non-profit organizations. Kevin is a broker, developer and manager of commercial and multifamily properties. He owns apartments and has provided development advisory services for projects in the Hilltop area of Tacoma. Kevin brings a property owner’s perspective to his role with Spaceworks. Kevin also provides community involvement and leadership experience including: president of the Hilltop Business Association; Vice Chair, Affordable Housing Advisory Board; Deputy Mayor, City of Shoreline; Trustee, Shoreline Community College; Board President and Treasurer, Center for Human Services and Member of the King County Economic Development Council. Spaceworks is particularly interesting for Kevin because of his personal entrepreneurial creative ventures. He and his oldest daughter owned and ran Pizza Pi, a vegan pizza restaurant. He moonlighted as a professional photographer while a photographer’s mate in the Navy, and then after moving to the Puget Sound he did technical, historic building preservation photography, including some early Pioneer Square renovations. Ben works with the UW Tacoma Campus Planning and Real Estate team to transform UW Tacoma’s 80,000 square feet of retail space into a regional shopping and dining destination. Prior to moving to Tacoma in 2008, Ben earned an MPA from the University of North Carolina School of Government, focusing on identifying new ways to leverage higher education resources for community and economic development. He then spent several years working with colleges and universities in North Carolina and the central Appalachian region to build campus-community partnerships for job and company creation. The outcomes of this work were varied, ranging from the launch of a new business incubator in Bristol, Tennessee, to the creation of student-based research services for county economic developers on the North Carolina-Tennessee border, to the planning and implementation of a college-wide effort to bring in last-mile broadband to underserved areas in southwest Virginia. Ryan Spence is an entrepreneur, designer and product developer by trade. He has worked on a variety of projects in Tacoma and the Puget sound region. He is the lead designer and builder for Elevate Climbing Walls and worked to relocate Elevate’s production facility to Tacoma from Seattle. Ryan has designed multiple indoor rock climbing facilities in the region including Climb Tacoma, The Climbing wall at The University of Puget Sound, The Island Rock Gym, and the Vertical World Gyms in Seattle and Redmond. He also worked on the facility master plan for the University of Puget Sound and designed the Pizza Cellar Restaurant on campus. In his free time Ryan advocates for public skateparks, participates in the city planning process, and curates The Flashback Scuba Museum. The Flashback Scuba Museum located in Tacoma houses a wide variety of equipment and artifacts from the history of diving and undersea exploration. The museum houses the largest private collection of Jacques Cousteau equipment and documents. The museum is made possible through creative partnerships with small business, property owners, and partner facilities like the Foss Seaport. Ryan is a published author and serves on the Board of the Historical Diving Society USA. Ryan brings his background and experience in design, planning, business, and community development to the Spaceworks team. Ryan practices his belief that re-purposing underutilized spaces builds community, and encourages economic development. Great things happen when the right idea is paired with the right space.